If you want a unique way to customize your clothing, free motion sewing is a great start. 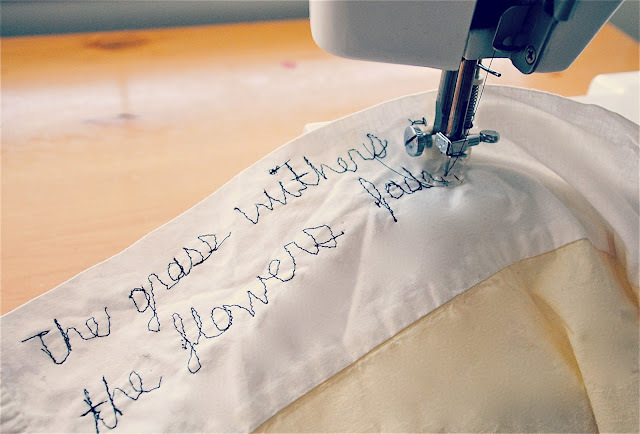 It doesn't require an expensive machine, or loads of time hand embroidering. It's pretty simple when using a basic free motion foot here. It takes some practice but you basically just write or draw with the machine while moving the fabric with your hands. It's best to do this on tougher fabrics like canvas and denim. I've tried jersey or stretch fabrics with little success. You can even create tags of your brand by using twill tape. Customize denim, cotton shirts, or pillow cases. That's such a clever idea! I never would have thought of that. I'm going to get a free motion foot this weekend! Love it! I just found your blog...addicted to it now! How does the free foot work? I love the bonjour blouse! 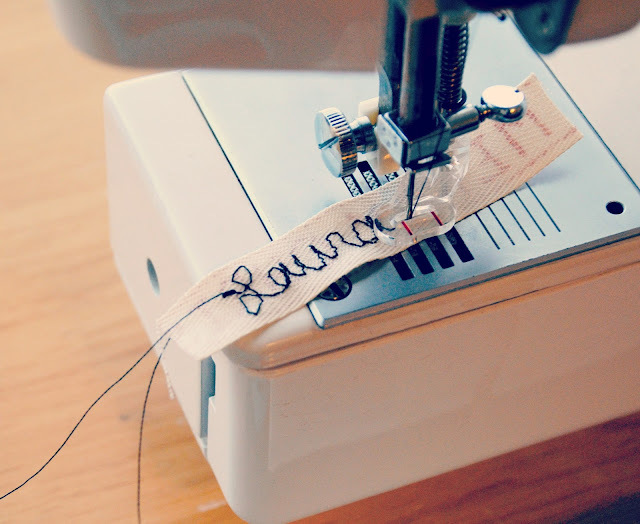 Just discovered your blog and if its not too much trouble would like to ask which sewing machine you would recommend. I've been going through your entries and everything looks so fun I can't wait to try them out! Wow, I did not know you could do that without an embroidery machine. This is unique and you are so talented this is very nice i really like this. • Your article is fantastic and rewarding. I like it quite definitely. Hope to learning much more content from you. Wonderful post,thanks the article is apreciated and bookmarked. Skilled training online help you boosting the formations of memories of an individual. Moreover, it also helps in improving the two other significant cognitive areas, working memory and sustained attention. These skills are maintained for 6 months after the completion of training.